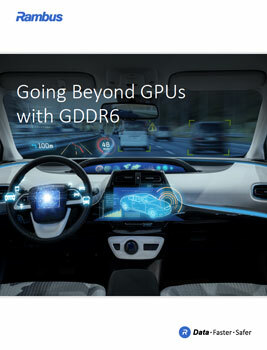 Supported by Micron Technology, SK Hynix and Samsung, GDDR6 SGRAM will feature a maximum data transfer rate of 16 Gbps, along with an operating voltage of 1.35V. GDDR6 offers higher densities compared to previous-generation graphics memory. In addition, GDDR6 doubles the speed (12–16 Gb/s) of GDDR5 and provides more than 5X the 3.2 Gb/s speed of DDR4. Moreover, GDDR6 supports the same low external voltage (1.35V) as GDDR5X, although it is based on a dual-channel architecture instead of GDDR5X’s single-channel architecture. Although initially targeted at game consoles and PC graphics, the latest iteration of GDDR is expected to be deployed across multiple verticals, with Micron specifically highlighting the data center and automotive sector. Learn how GDDR can be deployed across multiple verticals, including self-driving vehicles and the data center.